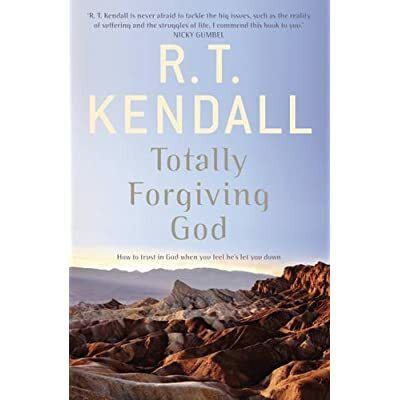 Posted below is a vital and thought-provoking article written by Michael Eaton concerning Dr RT Kendall’s latest book which is controversially entitled ‘Totally Forgiving God’ – a provocative idea since most theologically aware readers might be shocked at the very idea of ‘forgiving God’ since God is as far from committing sin and wrong as it is possible to be! The issue here is that even the most mature and experienced believer – let alone cynical and angry unbelievers – can display anger, bitterness and outraged complaints over God’s past and present dealings with their lives. The most outspoken of these ‘victims’ are not only incensed by God’s ‘injustice’, but are bitter and hostile to the very idea that God is good. Tragically, all too many of these people once loved God, or still do, so the challenge for all of us is to come to terms with the mysteries of God’s painful dealings with us, and our deep disappointments when God apparently fails to show up for us at times when we needed Him most and expected more from Him. Once again, RT has drawn from his own varied and often painful life-experiences to comfort others with the comfort he himself has received from God. Radical problems need radical treatment. This book will undoubtedly help to mend many broken hearts (2 Corinthians 1:3-7). “There are two reasons why a certain kind of ‘orthodox’ Christian might not like RT’s ‘Forgiving God’. One is that the very notion of ‘forgiving God’ sounds somewhat heretical. (Some reviews seem to denounced the phrase without reading the book to see what the phrase means! That seems to require some forgiveness too!) It might be said, ‘Forgive’ means ‘to pardon wrongdoing’ and God is not guilty of anything. Yes, of course, it is true! RT himself says as much again and again (Read the book!). It is clear (surely!) that RT is using the word somewhat differently to make the (very obvious!) point that God’s tough and largely inexplicable ways in this world often cause us a lot of pain. So we have to consider within ourselves what we are going to do about this ‘suffering’ that God causes (or ‘permits’, or whatever). We have to get through to the point where we let God do whatever he wants, where we allow him to be totally sovereign, where we break away from resentment, where we let him ‘explain himself’ in his time (maybe on judgement day) and not right now as we would like. This ‘getting through’ to the point where we let God be God RT calls ‘Forgiving God’. It is of course a metaphor. We do not literally forgive God and RT says again and again that nothing he says should be taken as blaming God. The hyper-orthodox critic tends to jump too quickly (even before they read the book) into criticism. The phrase ‘Forgiving God’ is provocative and untraditional. The hyper-orthodox – like the Pharisees who did not like healing on the Sabbath – jump in too quickly to criticize. Forgiving God is going to be widely read. I guarantee it! The provocative language will offend some but thousands will identify with it and say immediately, ‘I know what he means’. The other reason why a certain kind of ‘orthodox’ Christian might not like RT’s Forgiving God is that it deals a lot with subjective feelings. It is therapeutic, one might say. Now this person I have in mind – a type not any particular person – is the exact opposite. I call him a certain kind of ‘orthodox’ Christian. He is very ‘objective’. He points – quite rightly – to the sheer ‘objective’ facts of God’s sovereignty, God’s right to do as he wishes, and so on. He does not like anything which gives a hint of tender feelings, of emotional comfort. He is nervous about ‘comforting’ people. He does not want to be ‘therapeutic’. He wants sin to be denounced, Jesus’ atonement to be declared, justification to be proclaimed. One would like to add ‘… and eternal security to be assured’ – but actually this certain kind of ‘orthodox’ Christian tends to add so many conditions to eternal security that it becomes eternal insecurity! He likes old-fashioned traditional language and is critical of anything being said in a new way. A glance at a title will bring down the spirit of denunciation! The great question is: does the Bible stress the objective or the ‘comforting’? Clearly it does both. Jesus could talk about his being a ransom for sins (Mark 10:45 and so on). Very objective! But look at the thirty-five miracle-stories of the gospels. It is surely obvious that as well as ‘telling the truth the way it is’ Jesus could also be incredibly ‘comforting’ and incredibly unorthodox. Imagine making hundreds of litres of wine for a wedding! Imagine stopping, while on an important journey, to talk to an old lady and give her comfort the way Jesus did What should we think of his touching lepers, his chatting to a scandalously immoral lady with no one else around, his inviting himself to dinner with a notoriously corrupt tax-official, his totally ignoring Peter’s confession of his wickedness (Luke 5:8). How can he just say to someone ‘Your sins are forgiven’, without first denouncing them? How can he heal someone who does not even know who Jesus is (John 9). ‘I did not come to call the righteous…’ – what would the hyper-orthodox say to that; the language is provocative!